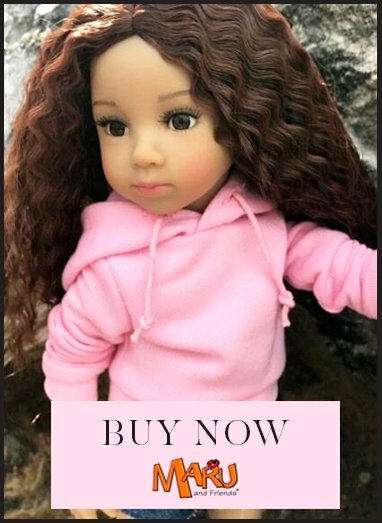 Ally is one of Ciao Bimba's Mini Darling dolls, made from the finest materials for Waldorf dolls, and she takes over 12 hours to make by hand. Ally is one of Ciao Bimba's Mini Darling dolls, made from the finest materials for Waldorf dolls, and she takes over 12 hours to make by hand. She lives in the countryside where one of hef favourite things to do is run through the fields and play with her goose (who she sometimes dresses up!). Her dress is made from Goosey Gladrags Liberty print fabric, her skin is made from the finest jersey fabric for Waldorf doll-making, and has a sunkissed glow. She is filled with wool, sourced directly from local farmers in Bulgaria. Her hair is a mohair weft wig crocheted and then stitched into place on her head. She has been made from natural materials that are safe for children. Ally and her Mini Darling friends are beautiful cloth dolls inspired by the Waldorf pedagogy, whose teaching is that through sensory play a child becomes more imaginative, and even perceptive. The child develops those senses its experiencing, building the neurological pathways associated with each one. Children find sensory play therapeutic and even soothing. Ally is firm but does not stand up on her own. Her head is sculpted using needle felting techniques which is how doll artists manage to create such a darling face. Waldorf dolls have mostly neutral faces so that a child can project its emotions on to the doll, so the doll might be happy or sad; laughing or crying. It's so important for a child to develop its imagination as it plays. The Mini Darling doll Ally comes with her own sweet goose friend.